G. E. Rumphius, also known as the "Indian Pliny," was one of the great tropical naturalists of the seventeenth century. Born in Germany, he spent most of his life in the employ of the Dutch East India Company, stationed on the island of Ambon in eastern Indonesia. He wrote two major works; this one, the first modern work on tropical fauna, was published posthumously in Dutch in 1705. A classic text of natural history, it is now available in English for the first time. 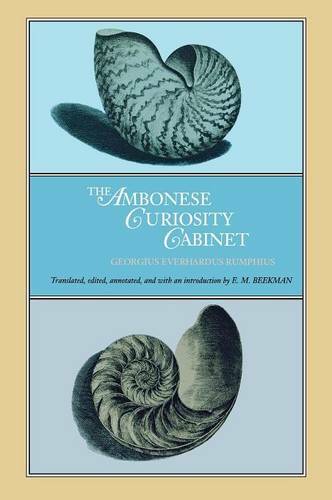 The descriptions in The Ambonese Curiosity Cabinet cover the gamut of organisms found in the seas surrounding Ambon-crabs, shrimp, sea urchins, mussels-as well as minerals and rare concretions taken from animals and plants. A series of exquisite etchings accompanies the descriptions. The book has been masterfully translated and extensively annotated by E. M. Beekman, whose introduction provides the first biography of Rumphius in English that incorporates new material.